The on-going BMW Malaysian Open 2011 today spread its influence and reach for a good cause as Francesca Schiavone, along with Ayumi Morita, Shuko Aoyama and Chan Chin Wei took time off their busy schedules to support a good cause, ‘The Power Over Cervical Cancer (POCC) – Helping To Protect Every Woman’. which is an integrated communications campaign on Cervical Cancer Education and Awareness, by the National Cancer Society of Malaysia (NCSM). At the NCSM’s headquarters, the players met with the NCSM’s management and staff who run an invaluable service for women in helping and aiding women to discuss with their healthcare professionals (HCPs), on medical problems and issues while seeking protection against cervical cancer with pap smears and vaccinations. 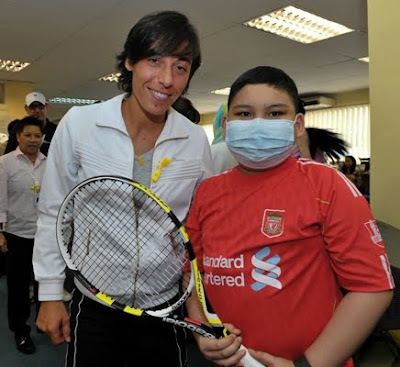 The players were also taken on a tour of the NCSM’s headquarters and facilities, as they met and mingled with cancer survivors, current patients undergoing treatment and medical consultation, as well as local celebrity ambassadors who champion NCSM’s causes and activities, such as Sarimah Ibrahim, Genevieve Sambhy, and the Chong sisters Vanessa and Pamela.